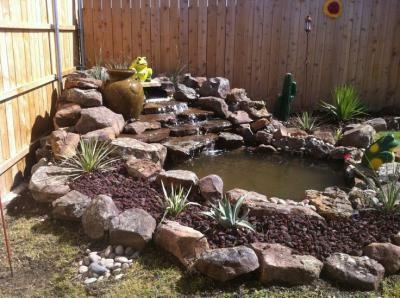 Groundscape Solutions, A Fort Worth Landscaping Company, Designs and Installs a beautiful Backyard Waterfall with Natural Plants. This waterfall is made with decorative rock, river rock, and lava rock. These waterfeatures add a beautiful backdrop to any landscape and a relaxing background noise. Surrounded by natrual plantings provide color and balance to this waterfall. Give us a call at 817-759-0102 for a quote or visit our website at www.groundscape.com Groundscape Solutions is a fully insured landscaping company and will provide references.